The day I decided to change the world. I’ve thought about this kind of proclamation before, but have resisted. Perhaps I didn’t know for sure if I had it in me. No more. Today, I can proclaim with absolute certainty that I’m doing something meaningful with my life, and it’s going to change the world. To be sure, this is a moment that’s been a long time coming. Through a series of conversations and synchronistic events, the Universe has lined up to propel me forward along this meandering path. I was talking with my friend Don earlier and our conversation drifted toward the topic of putting one foot in front of the other, even when we have no idea where the path is leading. Don said something that stuck with me – he said that he admired me for my conviction and pursuit of truth and justice and that my work had inspired him to continue his own work in a time when the path forward seemed the most uncertain. After that conversation, I took a ‘break’ to watch a couple of films; Tapped and The Cove. Not exactly light subject matter by any stretch of the imagination. Tapped is a documentary about the bottled water industry and its insidious impacts on society as a whole, and The Cove reveals the shocking slaughter of dolphins in Taiji, Japan. Both of these films deal with raising awareness about mindless consumption and disregard for nature and other beings in the pursuit of profits or convenience. This reminded me that individuals can and do make a major difference through fierce determination and pursuit of justice across the world. I thought about the work that I myself have embarked on in the aftermath of the BP oil spill in 2010, and the message of personal change that I have been crafting around this effort has truly come into focus in these last few days. I am convinced now more than ever that I’m meant to take my story out to the world and share it with as many people as will listen. I finally understand that to do any less would be a waste of potential, and would not serve the world in any way. This is the work that I’m most proud of, and it’s the next step out into a new frontier for me. This new stage is about story telling and sharing my experience of a person with an idea for making a difference that had no choice internally but to pursue it. I’ve struggled with this. I need help to take this out into the world, but I’ve been afraid to ask for it. Maybe because I didn’t know how or even what to ask for. Maybe the fear of hearing ‘No’ was too strong. 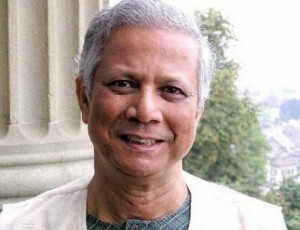 I was recently selected for an upcoming one-on-one call with Nobel Prize winner Muhammad Yunus, the founder of Grameen Bank. I attended a local screening for the film To Catch A Dollar, which chronicles Grameen Bank’s entry into the United States, and how microfinance has pulled people out of poverty around the world. After the film, I was picked as one of 3 people to have a personal Skype call with Mr. Yunus. Something I said in the application caught their attention, and I am honored to have this opportunity to connect with a visionary individual that has changed the lives of countless people across the globe. In recent months, I’ve received the support of some of the most talented, passionate, and giving people that I know. 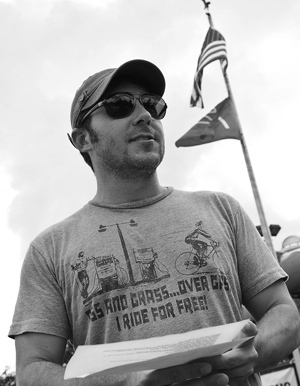 My desire to make a difference by sharing stories from the Gulf coast has become a reality, but there is much room for growth. The world is not served by my thinking small, and therefore it’s time to truly embrace big thinking. I am seeking the ability to travel across the country and talk to people about my experience connecting with communities along the coast and my own struggle to limit consumption and live a more mindful existence. I especially want to empower kids with the story of an individual making a difference through learning and self-discovery, along with a collaborative spirit and genuine desire to serve. My friend Jeff often muses that the Wright brothers didn’t have a pilot’s license, and I would add that I don’t have a degree in making a difference or a Ph.D in saving the world. I just know that I can make a difference and change the world by standing up for what I believe in and being one of the ones who makes change happen. My friend Dave tweeted a Hafiz quote earlier: “I wish I could show you, when you are lonely or in darkness, the Astonishing Light of your own Being.” This quote and his blog entry on connectedness really hit me, hard. I’ve written recently about my beliefs on connectedness, and this was especially meaningful to me tonight. I’ve wanted to change the world for quite some time now, but wanting is not the same as deciding. Today, I am deciding to change the world. If you’re willing to help or just want to follow along, I’d love it if you would leave a comment explaining how or why. Thanks for letting me share my journey with you. How are you going to change the world?